Every year, thousands of tourists board an express train or hire a car in New Delhi and journey to Agra on a pilgrimage to the Taj Mahal. To the Western World, the image of the curved white domes of the Taj Mahal, displayed endlessly on travel brochures, is synonymous with India. However, the postcard picture does not adequately convey the legend and romance that shroud the world’s most well-preserved and architecturally beautiful tomb. The story behind the Taj Mahal has its roots in the Mughal Dynasty, a line of Muslim emperors who reigned in India from 1526 to 1858. Agra, once the capital of the Mughal Empire, was the centre of wealth of one of the most extensive empires in the medieval world. During this time, Indian culture and art flourished, leaving many structures of historical significance to Indo-Islamic architecture. 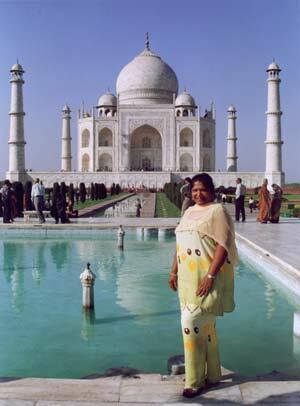 But none are as famous as the Taj Mahal. In 1612, one of the world’s greatest love stories began when Mumtaz Mahal, a Muslim Persian princess, married Shah Jehan, known as Prince Khurram before he ascended to the throne in 1628 to become the 5th Mughal emperor. The queen’s real name was Arjumand Banu. In the tradition of the Mughals, important women of the royal family were given another name when they married. Although Mumtaz was Shah Jehan’s second wife, she was considered his ultimate love match. By all accounts, Mumtaz and the emperor were soul mates. Mumtaz accompanied her husband throughout his travels and military expeditions, and was his most trusted political adviser. Unfortunately, as with any legendary love story, tragedy lurked in their future. In 1630, Mumtaz died while giving birth to her 14th child. The death of Mumtaz reportedly affected the emperor so deeply that his black hair and beard turned snow white in just a few months. The emperor was overcome with grief, and vowed to keep his beloved wife’s memory alive forever. He decided to build her a monument of eternal love. Because Mumtaz had endeared herself to the people with her kindness, the emperor’s subjects were inspired to help build the spectacular monument. After twenty-two years and the combined effort of over twenty thousand workmen and master craftsmen, the monument was finally completed in 1648, at a cost of 32 million rupees. (That’s just over 1 million Canadian dollars—a lot of money in the 17th century!) It was built with material from all over India and central Asia and required 1000 elephants to transport the material to the site. Construction documents show that Ustad Isa, a renowned architect of his time, was the genius behind the structure. The emperor also sought the skills of expert craftsmen from other cities and countries. Four domed chambers surround the Taj. The main archways are chiseled with passages from the Holy Quran. The mausoleum is part of a vast complex with a main gateway, garden, mosque, guesthouse and several other palatial buildings. A large garden is divided at the center by four reflecting pools. 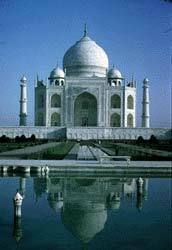 Like the Taj, the garden elements follow the Arabesque concept, standing on their own and constituting the whole. 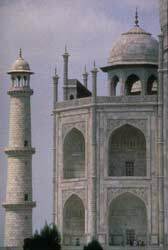 One of the most intriguing aspects of the Taj Mahal is the magical quality of its changing colours. The Yamuna River behind the Taj reflects light onto the white marble. Depending on the hour of the day or the season, the colours of the Taj are different. The best time to view its stunning beauty is at dawn or sunset. 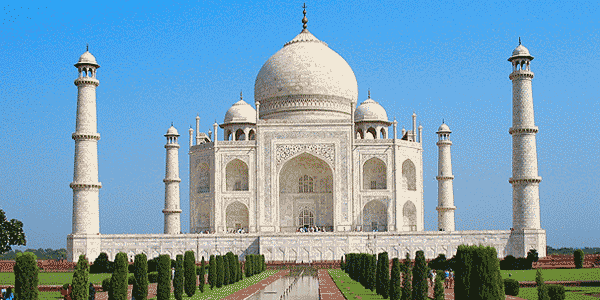 The origin of the name Taj Mahal has never been clearly documented. 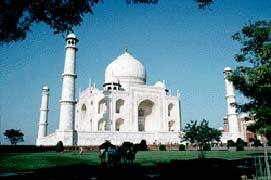 Court histories from Shah Jehan’s reign refer to it as the rauza (tomb) of Mumtaz Mahal. 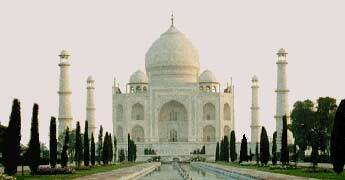 It’s generally believed that Taj Mahal, usually translated “Crown of the Palace”, is an abbreviated version of the name Mumtaz Mahal, which means “Exalted One of the Palace”. There are many contemporary (and some might say, unromantic) historians who contend that the Taj Mahal is a mausoleum far too great to commemorate the memory of one woman, even if she was the favourite wife of an emperor. These historians believe that the Taj Mahal symbolizes the tyranny of a powerful ruler exploiting his subjects and flaunting his magnificence to the world.